My favourite thing about twitter is that I can easily post a link to something I want to share with you. I’ve decided to make a weekly habit of collecting all those links into one post. The idea is to give you some easy inspiration on a Sunday/Monday morning. It’s raspberry season in my backyard! Perhaps one of my favourite things to eat are raspberries, so heading out to the yard to pick some each day is a real treat. I’ve got both red and white raspberry bushes, so far there have only been white berries this year and they are delicious. cute wedding photos. i love the groom’s tie. amazing circus themed wedding. love every little detail. how much fabric? charts that show the average amount you need for sewing patterns. brilliant idea! I want this twin lens reflex camera (via DailyCandy) – what colour to get? pennies as floor tiles – i wonder if it’s cheaper? Hey..I’ve been following your blog for a little while now but I have never stopped into say how much I love it. This post tipped me over the edge though, it was so thoughtfully put together. You’re filling the hole that alittlegoodness has left empty! this is one of the highlights of my day! On the couch, dog on my lap, mint chocolate chip ice cream, and makesomething.ca! the raspberries look absolutely delish! I’ve just added them on my list of “one day in my garden I will have…” Do you think you could grow them in those soft planters? 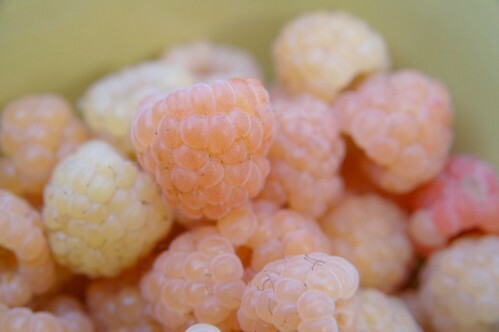 I don’t think I’ve ever tried white raspberries. I must get my hands on some! 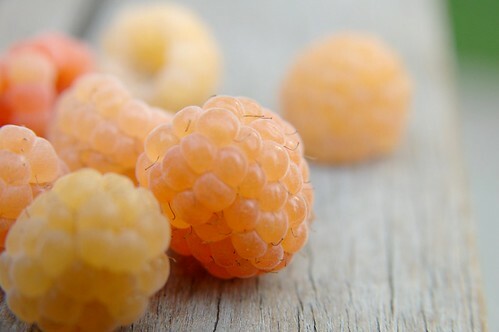 love the pictures, never had white raspberries but the look yummy! Our raspberry bushes are really going crazy with deliciousness this summer, too! Nothing like stepping outside to pick your breakfast. yum! harhar…pennies as floor tiles. this post and the list made me giggle. i hope you had a great weekend karyn! dara – hi! it’s nice to meet you! funny thing is that i’m meeting up with alittlegoodness today for lunch, as she passes through town. hopefully she’ll be back blogging soon. tasha – mint chocolate chip ice cream?! you’re making me hungry. (& jealous) ideally raspberries need a bit of room, especially if you want a good crop. it would have to be a very large soft planter to get a good bush going. also, they need a few years to ‘take’ and give you a good harvest. the first year i had them, i got about 3 berries. Now, i can pick a bowlful every day or so. 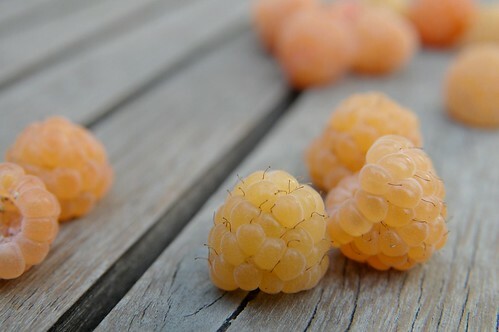 Jane & Sarah Anne – they are also called ‘golden’ raspberries and i wouldn’t be surprised if you could find them at Whole Foods or perhaps a farmer’s market. Johanna – all this rain produces lots of yummy berries. pause. i had to run out to the back just now to get a bowl! Melissa – maybe i’ll try the penny tile in my kitchen… it would be a lot of work though! Kate – for some reason they taste even better when you grow them yourself. Camera — I’ve been meaning to ask you what camera you use and whether you like it? I’m in the market — yay! The furniture socks are a good idea, not just for decoration but to save the wood floors, and possibly cushion toe-stubbing, for which my couch is bad bad! also – those cameras are really neat, but I am a bit bummed that they shoot 35 mm film. I’d like to try taking some photos with a medium-format camera… I’m not sure why, but it seems like the larger lens and larger film area makes for more “professional” looking photos. I guess there is always the Holga.